It was evident that the year 2000 pumpkin season had been a tough one in New England based on the number of growers absent from the Big-E weigh-off. The weights seem to be down on average this year too. 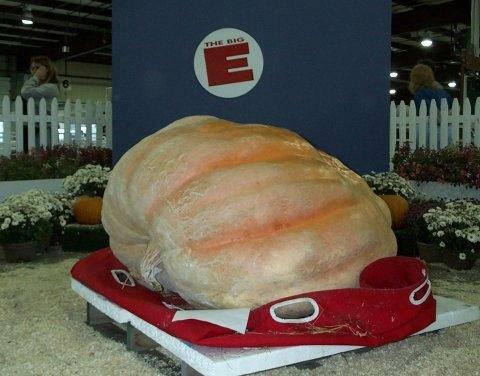 Joe Goetz is the Massachusetts state record holder having grown a 917.2 pound pumpkin in 1997. He also grew the largest squash in the GPC last year at 896.5 pounds. Joe lost all but one of his Atlantic Giants, and he is saving that one for Topsfield, so he brought this Gold Rush pumpkin to the Big-E. It got a few laughs as we brought it in on a lifting tarp! He got a ribbon for it too (they created a field pumpkin class just for Joe). The big winners at the Big-E were the McNamee family. 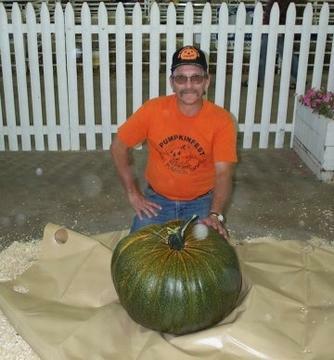 Bob and Sue's 621.8 pound pumpkin took first place. Their son Danny won the kids contest with a 420 pound entry. Congratulations to the whole McNamee family! Great job! 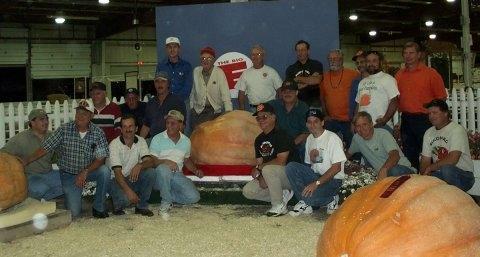 They were able to get all the growers to gather around the winning pumpkin for this group shot. Below are the results of the squash and pumpkin contests with a photo of each entry.